Photo: Sachyn Mital, Courtesy of Wikimedia Commons. 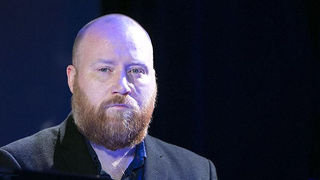 Jóhann Jóhannsson, the Academy Award-nominated Icelander composer responsible for scoring Arrival, mother!, and Stephen Hawking biopic The Theory of Everything, has passed away. The report was confirmed by his manager, Tim Huson. Jóhannsson, whose stunning score for Arrival eerily ushered what felt like a new generation of scifi film storytelling, was in Berlin when he died. The cause is not immediately known. He was 48. At io9, we’ll remember Jóhannsson as a brilliant composer of genre scores, a man who soundtracked one of the best scifi films of the past decade. Below, I’m sharing one of the tracks from his incredible Arrival score. The whole thing is streaming. Today is a good day to listen.